As Marabou wraps up their interpretation of the American narrative told through the objects and curation of The Met’s American Wing, there is one other population’s voice glaringly omitted: that of immigrants. Whether serving as factory workers in the booming textile and garment industries or building the railroads that allowed people to travel across the country and see America’s majestic landscapes, immigrants were essential to the growth of America’s economy and physical infrastructure in the nineteenth and early twentieth centuries. Some of the artwork in the American Wing was made by immigrants and, for the most part, immigration and immigrant experiences are described specifically in relation to the immigrant artist on display. “The Ameya” (04.31), Robert Blum, 1893. The one area of the American Wing where Marabou sees a variety of cultures represented is in Gallery 766 entitled “Cosmopolitan Spirit 1860-1900.” In this gallery you will see “The Ameya,” showing a Japanese ameya (candy blower) in the street, capturing the interest of passersby, may of them mothers with children on their backs. Another painting, “Arab Jeweler,” shows a man sitting on the floor as he stokes the fire to melt metal for crafting. A third painting entitled “The Rajah Starting on a Hunt” presents a palace in Ajmer, Rajasthan, India, and men preparing for a hunting outing. The gallery text explains, “In the late nineteenth century, the taste of American viewers and collectors changed in response to their expanded opportunities for travel…American artists working in all media lived and studied abroad and investigated a wide range of subjects and styles in order to attract patronage.” Marabou finds it funny that The Met decides to just focus on nineteenth-century Americans looking outside of the US, leaving to travel or to paint, and not acknowledge that at the same time millions of people from all over the world were immigrating to the country. Where wealth and privilege allowed affluent Americans to freely explore beyond US borders, desire for economic opportunity, escape from persecution, famine, and other hardships were pushing people to leave their homelands for the United States. Why aren’t immigrant experiences and contributions more explicitly addressed in the American galleries? Along with avoiding the mention of immigration as a big part of American history, The Met has missed other opportunities to tie its art to contemporary conversations. The idea of “The Orient” or the exotic east (on display in the paintings of Gallery 766), as Edward Said explains in the introduction to Orientalism, “was almost a European invention, and had been since antiquity a place of romance, exotic beings, haunting memories and landscapes, remarkable experiences.” Although The Met does say Edwin Lord Weeks favored the “Orientalist” style, the label could go on to explain that these fantasy-like portrayals of India (and other locales east of Europe) fueled affluent Americans’ interest in traveling to these places. How interesting would it be if The Met explored the fantasies and stereotypes presented in Gallery 766’s paintings? Labels could pose thought-provoking questions like: “The Middle East and men like the ‘Arab Jeweler’ were admired and looked at with fascination by nineteenth-century American viewers. How have perceptions of Arab people and the Middle East evolved and changed from the nineteenth century to the twenty-first?” Obviously this question would spark a variety of conversations, both productive and reductive, but visitors would start to actively engage with the art. At best, visitors would walk away realizing or remembering that Orientalist ideas and stereotypes resonate today and actively influence political, social, and economic global policies. 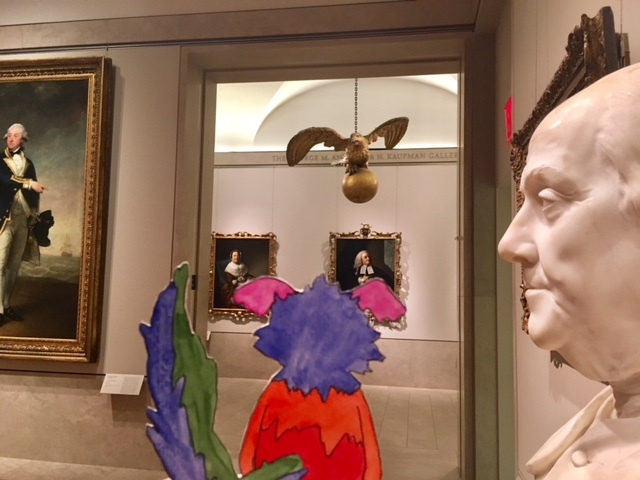 Marabou searches for meaningful connections between the paintings on display and how they relate to American history. Left: “Arab Jeweler” (22.69), Charles Sprague Pearce, c. 1882. Right: “The Rajah Starting on a Hunt” (15.30.68), Edwin Lord Weeks, c. 1892. What populations are represented within the curatorial team? What is the curator’s cultural proximity to the objects they curate and cultures they talk about? Where did curators and staff members study? What approaches are taught by those educational institutions? In short, ask, Why are stories told in a certain way? Who is telling the stories? Who taught the storytellers how to craft their narratives? These questions start to probe the deeply ingrained structural framework that perpetuates the particular way of thinking that permeates American culture. When a museum has a predominately white staff and the stories of marginalized voices are missing from museum content, there is a definite connection between the two. When an existing structure (for example, the construction and telling of history) has included you and made you feel comfortable, why would you challenge the system? When curatorial staff is hired from the same socio-economic populations who attended a certain set of schools, a certain mindset and academic approach is being practiced without the presence of a counter perspective. Inclusion and representation in a museum is not merely making sure a museum’s collection contains objects that represent a wide spectrum of populations. This is not enough. Curatorial approach must be analyzed and re-thought. Curatorial staff and hiring practices must be looked at and reconsidered. The board of trustees and anyone who gives money to a museum and has influence to make decisions must be looked at, reconsidered, and held accountable. These steps are only a small part of a much larger process. Museums are not just reflections of the world as it was. In their institutional structures, museums still very much represent the world as it is today.